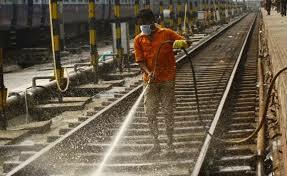 BHUBANESWAR: The East Coast Railway (ECoR) has decided to begin a nine-day long massive cleanliness drive 'Swachh Rail Swachh Bharat' campaign from September 17 in its zone spread over Odisha and portions of Andhra Pradesh and Chhattisgarh. The campaign will include special drives on cleanliness at railway stations and trains with a focus on cleaning of water booths, drains and adequacy of dustbins, garbage disposal, hygienic foods and other cleanliness works. Railway Board has asked the general managers (GMs) of railway zones to carry out the campaign in their respective zones. The campaign will be concluded on September 25, railways sources said. ECoR GM has advised divisional railway managers (DRMs) to identify the areas which are prone to unhygienic conditions and littering and take effective action to get lasting improvement. Railways will involve its employees and request other stakeholders like scouts and guides, school children and NGOs to carry forward the campaign. According to the plan, railways will devote the first day for Swachh Paryavaran (clean environment) of general cleanliness of surrounding of railway stations and trains. Beautification of station premises by pruning of trees, plantation and landscaping will be undertaken on the day. A drive on garbage handling and disposal shall also be undertaken at railway stations, trains and depots, said ECoR chief public relations officer JP Mishra.